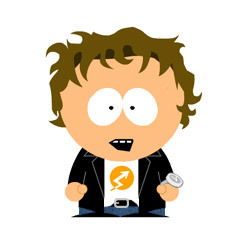 I see quite a few charicatures around the net, and the other day my head wandered into the thought “I wonder what I’d look like in South Park”? So, I thought I’d check online for some SP pics and use them as a model to create my own likeness in Photoshop. And then I ran into South Park Studio. Janina has created a cool flash app with dozens of different clothing and hair styles, eyes, hats, skin tones and accessories. A few minutes later, and I found my South Park alter ego staring me in the face. I did a little Photoshop customization to add a little more “me” to it, including a belt, watch, and my Zoomstart logo, but South Park Studio did all the heavy lifting. So what do you look like in the South Parkisphere? I gotta know! So I’m turning this into a meme … first, create you. And then capture your image in a screen shot by holding “Shift” and pressing “Prt Sc” and paste it into your favorite photo editor for final editing/cropping. Post your character along with a link to Janina’s site for others to follow. And then tag a few people to keep it rolling. And if you’re reading this, tagged or not, jump in and check it out. I’m glad you’re in! It’s a fun little tool. I made up a “group photo” the other day of myself and a friend and printed it out. She thought it was hilarious. I hope to see a lot of bloggers in South Park-o-vision! That’s hilarious Rob … I didn’t know you had that on there already … or maybe I did and it was stuffed away in my subconscious somewhere. Antbag.com » If I Were on South Park…. Anthony, I’m on my over to check it out right now! haha I haven’t been to that site in a while. I might have to try to make myself into a south park character! Hey Gregg, let me know if you do!